LOCATION.--Lat 40`50'04", long 76`49'37", Snyder County, Hydrologic Unit 02050301, on right bank at borough of Shamokin Dam, on grounds of Sunbury Generation LP, 1.0 mi downstream from Shamokin Creek, 1.5 mi downstream from Sunbury Fabridam, and 1.8 mi south of Sunbury. DRAINAGE AREA.--18,300 square miles, approximately (excluding that of Shamokin Creek). PERIOD OF RECORD.--October 1937 to current year. June 1918 to September 1918 (gage heights only), in reports of Pennsylvania Department of Forests and Waters. GAGE.--Water-stage recorder. Datum of gage is 408.61 ft above National Geodetic Vertical Datum of 1929. See WSP 1903 for history of changes prior to Dec. 13, 1937. Dec. 13, 1937, to Mar. 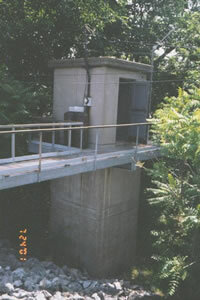 23, 1967, water-stage recorder at site 1.7 mi upstream at datum 11.05 ft higher. COOPERATION.--Station established and maintained by the U.S. Geological Survey. Funding for the operation of this station is provided by the Pennsylvania Department of Environmental Protection, the City of Sunbury Municipal Authority and the U.S. Geological Survey. REMARKS.--Flow slightly regulated by 14 flood-control reservoirs which have a capacity of about 809,000 acre-ft, and during low flow by Fabridam, forming Lake Augusta located 1.5 mi upstream. Supplied by NWS: Action stage-20 ft, river interests encouraged to monitor conditions; Shikellamy State Park closed due to high water; Flood stage-24 ft, both banks overflow; areas not protected by flood wall and levee system are affected; Moderate flood stage-26 ft, high water affects a number of homes and businesses in areas not protected by flood wall and levee system; Major flood stage-34 ft, most areas adjacent to river which are not protected by flood wall and levee system are affected by high water. Catastrophic flooding occurs in some of these areas.